Two of the UK's top bartenders have joined London-based Half Hitch gin as brand ambassadors. 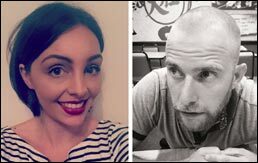 Maya Tarrant from London and Manchester's Martin Bilsborough are set to to drive growth and advocacy in the on-trade, and to build brand awareness through innovative educational programmes across London and key UK cities. The role of Half Hitch gin brand ambassadors required candidates with extensive knowledge of both the brand and the wider category, an astute understanding of gin heritage, its production processes, a strong background within premium cocktail environments, appreciation for developing and creating exceptional drinks and experiences, and passion for presenting and discussing all things gin. Standing out against the competition were candidates Maya, of JKS Restaurants, who is working alongside head of operations to develop the drinks offering across the group, and The Railway Kitchen’s Martin Bilsborough, both of whom will work closely with bartenders in their respective cities and around the country to deliver bespoke training sessions, interactive master-classes, and consumer and trade tasting events to communicate the distinctive flavour profile and production process of Half Hitch gin. Responsible for developing exciting drinks strategies including unique cocktail creations and exceptional signature serves, the new brand ambassador roles will see the pair build brand credibility by utilising their strong industry relationships to drive trade advocacy for Half Hitch gin; and create commercial opportunities through their understanding of what drives purchasing decisions behind the bar. Maya’s career in bartending began at Milk Thistle in Bristol under the expert guidance and support of Matt Fairhurst. Inspired to continue building a career behind the bar, Maya moved to London where she begin working at City Social, Tower 42 and the award-winning Blind Pig, where her love of gin grew after being given more opportunities to experiment with the liquid. Martin Bilsborough, former Head of Bar at Manchester’s only five star hotel, Hotel Gotham, began his bartending career in the UK before taking his skills overseas to the likes of Mumbai, Amsterdam and the Cayman Islands where he trained bartenders and offered drinks service consultation. Founder Mark Holdsworth adds: "After what has been a whirlwind couple of years with a number of awards along the way, since I launched Half Hitch gin, I am really pleased to be able to announce that Maya and Martin have both recently joined our team to lead bar training and education in London and Manchester respectively. This coincides with us now being represented in the UK trade by Catalyst Brands which we hope will take us to the next level of success."